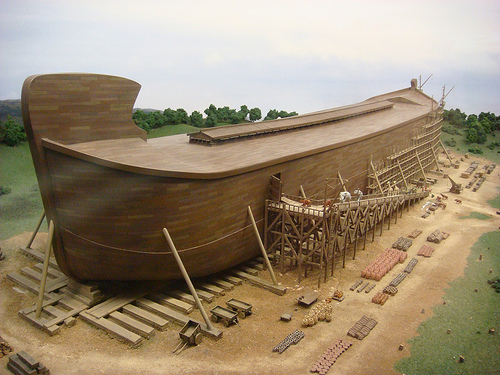 Answers in Genesis, the premier apologetics ministry for the biblical account of creation, published an article a few years ago about a remarkable man in Netherlands who decided to build a model of Noah's ark, based on the parameters given in Genesis 6-9. Dutch businessman Johan Huibers has constructed an ark replica that is roughly one-fifth the size of the biblical ark represented in the historical account given in Genesis. Huibers has stated that his desire in doing this project was to bring about a renewed interest in Christianity to Netherlands. I remember reading this article when it came out, and being so thankful for faithful men like Johan Huibers. We are living in dark times that only seem to be getting darker, but thankfully, there are always a few people hanging around who take God at his Word, right? My family and I spent the day on the lake yesterday with another family, good friends of ours. Because there were 8 of us (instead of our usual 4) and also because it was one of the busiest weekends of the year (Labor Day weekend), my husband reserved a pontoon boat for us. It occurred to me at some point during the day that I never get nervous when we are on the pontoon, even in the choppiest, busiest "water traffic." Why is this? Because a pontoon boat is incredibly stable, with its wide, flat bottom and evenly dispersed weight. Even in the roughest swells, it never even comes close to tipping. We have gone out before in some really fun, fast speed boats, but those can capsize in stormy or rough water. And it also occurred to me that a pontoon is built roughly like the ark that God had Noah build.....which of course was why the biblical, historical ark was so stable, even in the most cataclysmic flood the world has ever seen. Just another reason to give glory to God, for ALL wisdom comes from him......even in something so humble as boat building.